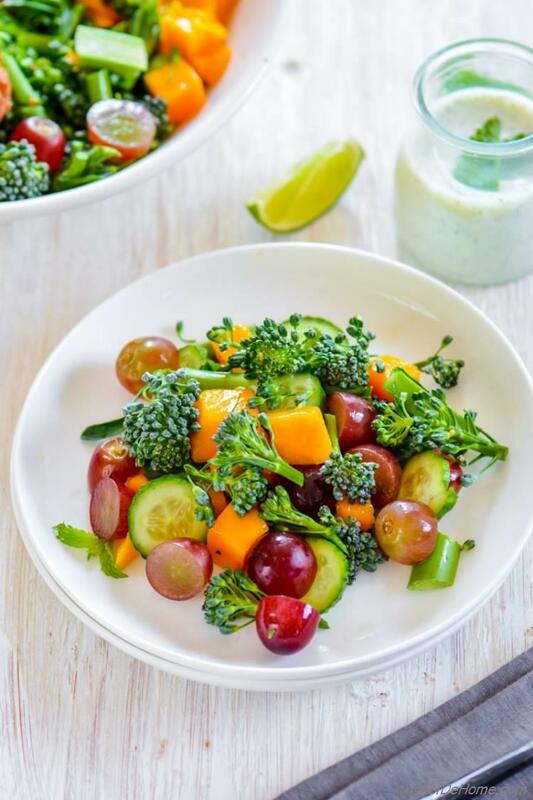 A healthy broccoli salad with sweet seedless grapes, and juicy fresh mango, coated in a lite and healthy buttermilk mint-lime dressing. Every fork of this salad will have something delicious to keep digging for more! 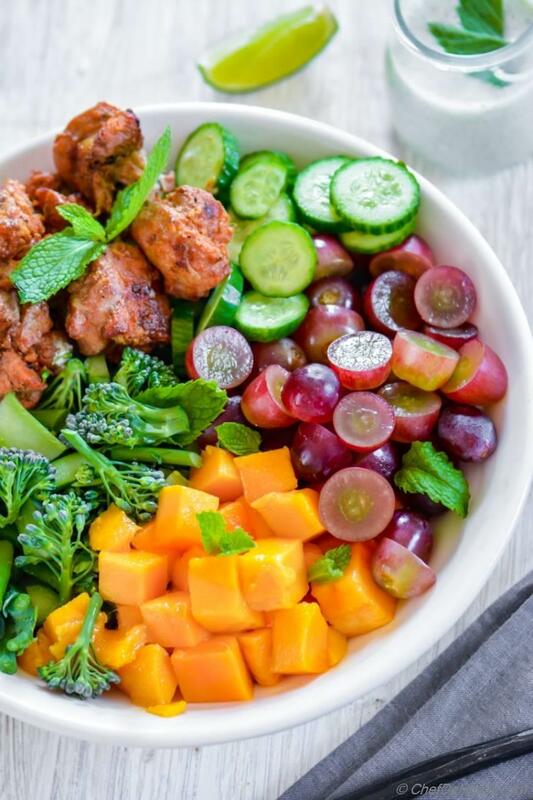 Sweetness of mango, juicy grapes, crunchy cucumber, earthy broccoli and meaty chicken - all make it a salad worth keep digging! Today, I served it with chicken to make it complete lite carb-free meal but at it's core, it is good vitamin and anti-oxidant rich vegetarian salad. A broccoli salad like this one is often on my summer lunch menu. Specially after weekend's grilling, I always have some leftover grilled chicken which works as great protein in Monday's lunch salad or even for lite and quick dinner. With just 15 minutes prep, this Broccoli Grape salad is perfect to make-ahead. I just make sure to pack chicken and dressing separate. Even though mixing dressing in salad will not make it soggy because there are leafy greens which will soak-up dressing but I still prefer to drizzle the dressing on the salad just before eating. So, you can tell that Broccoli Grape Salad makes great potluck pr picnic salad. It travels well and nothing gets soggy while you reach your destination. 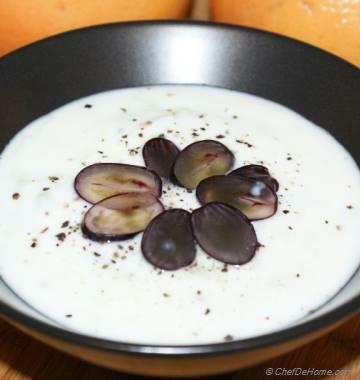 Oh, even kids will enjoy it because of sweetness of mango and grapes! I usually don't post over the weekend. But since this is Monday theme recipe, I wanted to give you this recipe in advance to try it on Monday. So here I'm sharing recipe over weekend for a change! For a good broccoli salad, the balance of sweet and tangy flavor is the key. I never used to eat raw broccoli. Ever since I started adding balance of sweetness and tartness to my broccoli salads with fresh fruits and tangy dressings... I have started eating raw broccoli salad more often then I eat steamed broccoli. Like in this salad, the sweetness of fresh seasonal juicy mango and sweet black grapes with tangy of buttermilk makes you go for second bite before you even finish the first! It is that good a combination. Speaking buttermilk reminds me to tell you that I use non-fat buttermilk for this recipe. And often even use non-fat yogurt mixed with few tablespoons of water. Non-fat buttermilk keeps dressing way healthier than mayo-based creamy dressings. Also, the tang of buttermilk pairs very well with mango and grilled chicken. The inspiration for this recipe came from my earlier post of Grilled Tandoori Turkey. In-fact, these pictures I took using the same turkey. 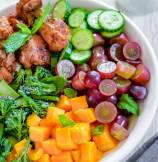 Turkey or chicken, any grilled meat will go great in this salad. 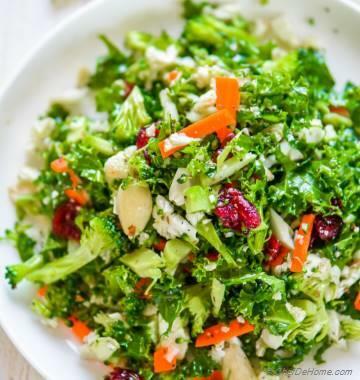 You can even skip chicken and replace it with tofu or skip protein and serve this salad as vegetarian, on the side, with your favorite protein. The idea of adding protein was to make it a complete meal. Otherwise, this salad makes a great healthy vegetarian salad on it's own. This salad is gluten free and also carbs free. It has abundance of Vitamin-C from grapes and mangoes, calcium from broccoli, and buttermilk, also protein from chicken (if serving). 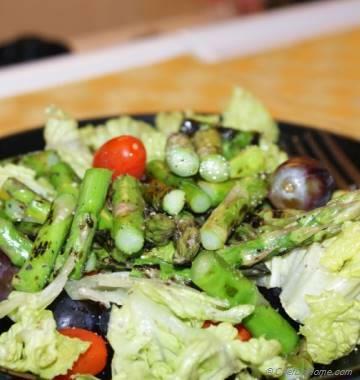 If you are serving this salad vegetarian, it is almost zero in fat since there is no oil in dressing, and buttermilk I a have used was non-fat. There are no processed sugars in this broccoli salad. Just natural sweetness of grapes and mango plus slight sweetness of agave in dressing. 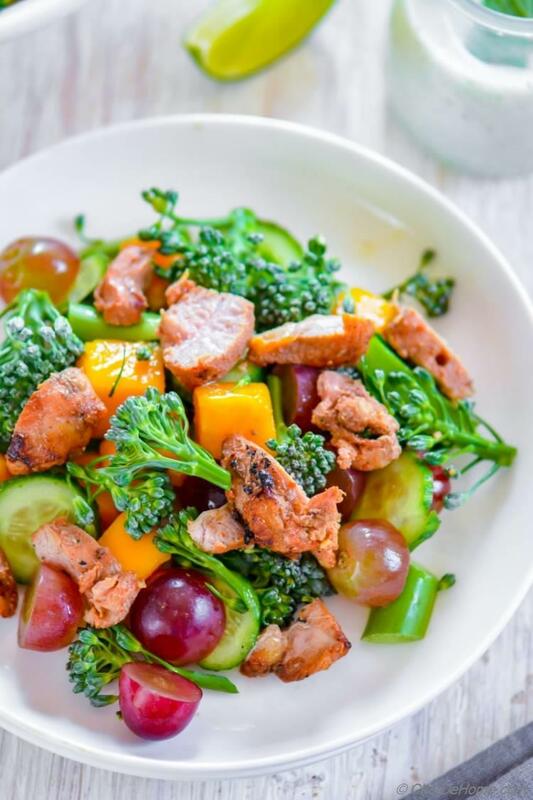 I hope I'm giving you a delicious reason to grill something for dinner and then pack leftovers with scrumptious and healthy broccoli grape salad! Juicy mangoes are on sales all over the stores! Don't forget to grab a few! The taste of mango really compliments this salad. I hope you enjoying weekend! Now, I'll get up to toss a new for lunch! See you soon again! Total Time 15 minutes Prep Time 15 minutes Cook Time 0 minute Difficulty Easy Yields 4-5 Servings Serves 5 Notes No. of servings depends on serving size. Smart Swap Skip chicken to keep this salad vegetarian. 1. Buttermilk Dressing: In blender or food processor jar, add all Buttermilk Dressing ingredients and process to make smooth puree. Remove in a bowl and refrigerate until ready to serve. 2. 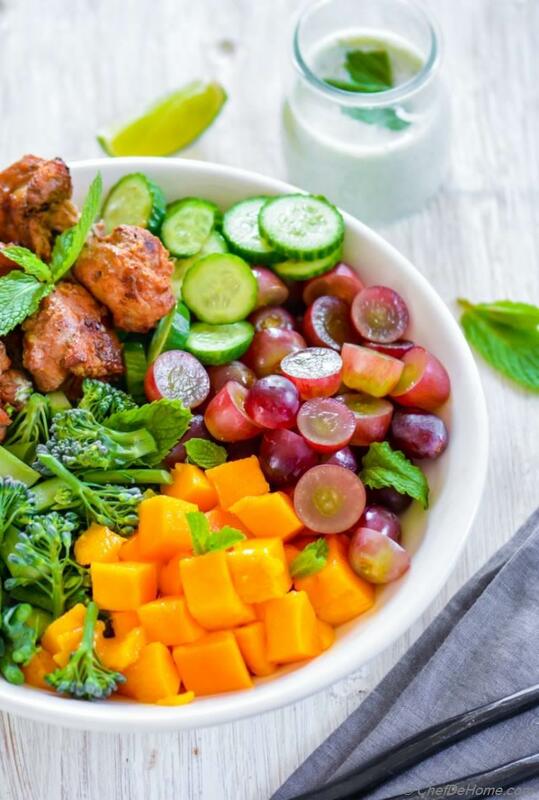 Add all sliced veggies to salad bowl.Top with grilled chicken (if serving), drizzle buttermilk dressing on top just before serving! Enjoy! such pretty pictures, love this salad :) and I miss you, been so long. Going to write to you soon!